Attacker Kazenga LuaLua’s marvellous display against Doncaster Rovers at the weekend saw him branded as ‘magic’ by Town boss Mick Harford. 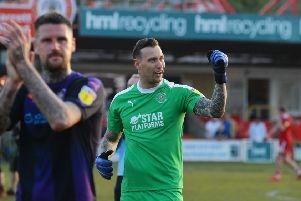 The 28-year-old was in for his first start since the 3-0 win at Shrewsbury on February 2, with top scorer James Collins away on international duty. LuaLua responded with a brilliant performance, setting up Pelly-Ruddock Mpanzu for his opening goal, while going on to score the third after Jack Stacey's marauding run before departing to a standing ovation from the Kenilworth Road faithful. Harford said: “Kaz is magic in the final third and he creates all kinds of things. “He’s a nuisance and I thought he had a great impact on the game. "We’re absolutely thrilled for him, he’s been patient, he’s waited his time and he’s gone in there and I thought he was excellent. “We’re just so happy for him as he’s such a super lad around the place. “For him to get a goal, contribute the way he did, it’s brilliant, for us and for Kaz. Team-mate Luke Berry was another player to praise the manner in which LuaLua went about his business on the day. He said: “He holds the ball up well, he’s so strong and his low centre of gravity is just phenomenal.